We’re not your traditional Mexican place. We just happen to think that tacos are a dish best served fun, with a side of liquor. Welcome to The Mule, where tacos, tequila and bourbon come to party. Located in one of Hamilton’s most beautiful spaces, we think we’ll be your new favourite lunch spot, your regular late-night haunt and your go-to destination for a good drink. Our bartenders have crafted a bourbon- and tequila-focused cocktail menu that will surprise and fascinate, and we also have a variety of beers on tap. And don’t forget the food. From baja wings to beef-tongue tacos, chef Matthew Kershaw’s menu offers an approachable and fresh twist on your favourite flavours from way down south. Our tacos range from classic Mexican to weird-and-wild-you’ve-gotta-try-this. All of our food is 100% gluten-free and we offer a variety of fare that is sure to delight your vegetarian and vegan side. It’s time to kick back, relax, grab a drink and eat some tacos. We are the proud little brother of The Other Bird family. YOU MAY OR MAY NOT SEE THIS WHEN YOU COME IN TODAY! Yes! Everything that comes out of our kitchen is 100% gluten-free. And we're very serious about that. You can eat tacos ’til your heart and belly are content. I like brunch. Talk to me about brunch. We like brunch, too! Every Saturday and Sunday from 11AM 'til 3PM we offer our brunch menu. Don't worry — there are tacos on that menu, too. Because you can totally eat tacos for brunch. If you’re looking to reserve space for a group of six or more people, please give us a call. Otherwise, tables are available on a first-come, first-served basis. We don’t have our own parking lot, but there are numerous on-street spaces and Green P lots nearby. Transit is cool, too. Tacos and tequila are a match made in heaven. But, bourbon as well? Why? Every Friday and Saturday night from 10PM 'til close this Mule gets a little crazy! The lights get turned down, and the hip hop beats get turned up! 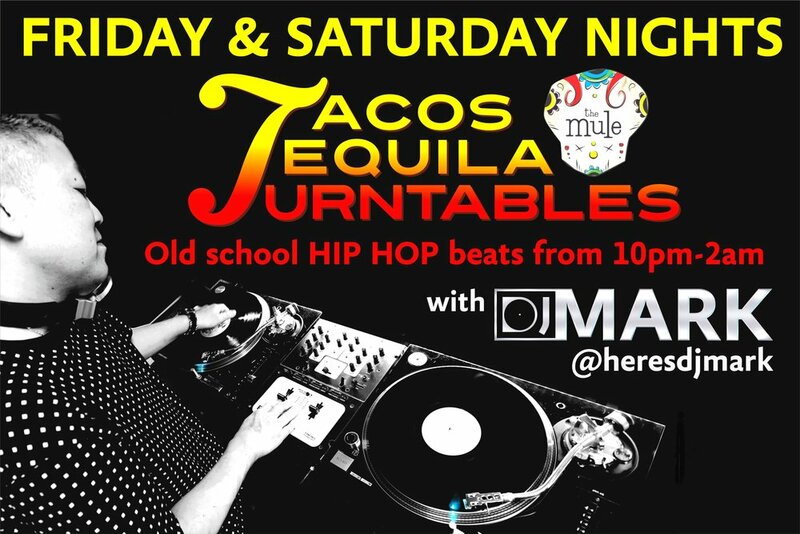 DJ Mark (from Dr. Disc) drops vinyl old-school jams to get your head nodding, and our talented bartenders will make you some incredible cocktails to go along with our delicious tacos, right up 'til 2AM! Guaranteed. Follow The Mule and DJ Mark on Instagram to get the latest updates! Every single Saturday and Sunday from 11AM to 3PM we serve the best, booziest brunch in town. Fried chicken tacos? Huevos rancheros? The best eggs benny you’ve ever tasted? Why, yes, we do have all of those things. Oh, and the booze. Mimosas, caesars and liquored up coffee are our specialty. Whatever debauchery you got up to the night before, we’ll help you recover.